1. Contracts vertically to grip the leg and stay up without leaving marks or restricting circulation. 3. The elastic free stretch top easily accommodates oversized calves. 4. Natural cotton fiber keeps feet dry by absorbing moisture. 5. The specially designed ventilated foot in these soft-top socks for diabetics keeps feet comfortable by reducing heat. 6. The seamless toe means a seam-free foot environment… no rubs, no irritation, no aggravation. 7. An Antimicrobial agent embedded in the fabric inhibits bacteria and protect against offensive odours. All this makes one favourite casual sock for men and women, even those troubled by fluid retention, swollen ankles or poor circulation. 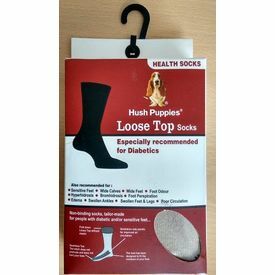 Hush Puppies Loose Top Socks - Especially Recommended for Diabetics Also Recommended for Sensitive Feet Wide Claves Wide Feet Feet Odour Hyperhidrosis Bromhidrosis Foot Persiperation Edema Swollen Ankles Swollen Feet & Legs Poor Circulation Non-binding soft top socks, tailor-made for people with diabetic feet 1. Contracts vertically to grip the leg and stay up without leaving marks or restricting circulation. 2. Loose Top’s unique construction and superior stretch fibers won't bind (which is good for circulation) or sag (which is great for comfort.) 3. The elastic free stretch top easily accommodates oversized calves. 4. Natural cotton fiber keeps feet dry by absorbing moisture. 5. The specially designed ventilated foot in these soft-top socks for diabetics keeps feet comfortable by reducing heat. 6. The seamless toe means a seam-free foot environment… no rubs, no irritation, no aggravation. 7. An Antimicrobial agent embedded in the fabric inhibits bacteria and protect against offensive odours. All this makes one favourite casual sock for men and women, even those troubled by fluid retention, swollen ankles or poor circulation.